“But before we can change the direction of our state, we all have to change our current mindset. We have to defeat cynicism. We have to stop saying: "Oh, politics is always corrupt; there's nothing we can do to straighten out that mess in Baton Rouge." Sadly, those words roll right off the tongue. We've all become accustomed to thinking that we really can't do anything about the corruption and incompetence in state government. We just can't think that way anymore. 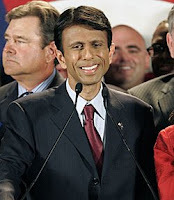 I'm asking you to believe that we can turn our state around.” Bobby Jindal, October 20, 2007. Governor-Elect Bobby Jindal spoke of ending incompetence and corruption in his victory speech. Changing the political landscape of Louisiana is a Herculean task that crushed previous reformers. I’m optimistic this time around. It’s all about the thinking, and the Governor-Elect zeroed in: We just can’t think that way anymore. Though precedes everything. There’s no doubt that if folks in Louisiana think about an honest and effective state government it’ll show up. If most continue to expect corruption and incompetence, then that’ll continue. Many folks haven’t given much thought to their thinking. The Governor-Elect has already challenged them. It’s self evident that people don’t always get what they want, but that they inevitably get what they expect. Come to think of it, not getting what is desired is because the expectation is the more powerful thought. Like attracts like. In my last post I reviewed “The Astonishing Power of Emotions” by Esther and Jerry Hicks. The book is mostly case studies of how people can improve the way they feel by altering ever so slightly the way they think about themselves, others, and so forth. That change in thought, resulting in emotional relief, produces more of the same. Louisiana can use some relief. Change the thought, feel the relief, create the better situation. Sounds like a plan to me.